This artist’s concept compares Earth (left) to the new planet, called Kepler-452b, which is about 60 percent larger in diameter. Credits: NASA/JPL-Caltech/T. Pyle. 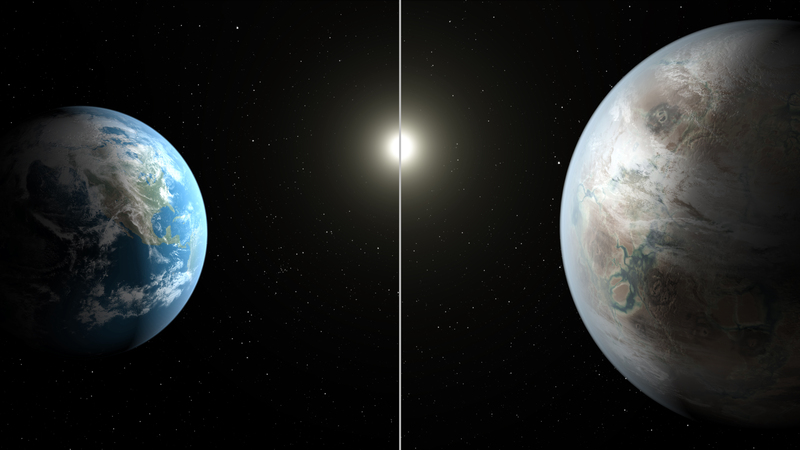 NASA’s Kepler mission has confirmed the first near-Earth-size planet in the “habitable zone” around a sun-like star. The newly discovered Kepler-452b is the smallest planet to date discovered orbiting in the “habitable zone” — the area around a star where liquid water could pool on the surface of an orbiting planet. The confirmation of Kepler-452b brings the total number of confirmed planets to 1,030. Kepler-452b is 60 percent larger in diameter than Earth and is considered a super-Earth-size planet and has 385-day orbit. The planet is 5 percent farther from its parent star Kepler-452 than Earth is from the Sun. Kepler-452 is 6 billion years old, 1.5 billion years older than our sun, has the same temperature, and is 20 percent brighter and has a diameter 10 percent larger.